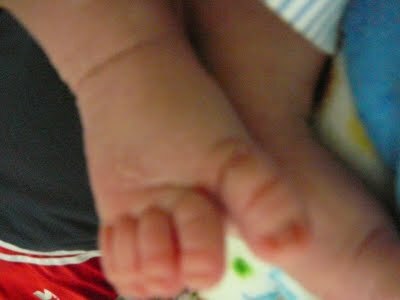 Ian has the tiniest feet. He is finally fitting into his size 1 shoes I bought him before he was born. They are the cutest, little Adidas Cleveland Cavalier shoes. They are still very roomy for him. We are going to have a problem finding shoes to fit him. Not because his feet are so small but because the tops of his feet are so fat. I tried to put some old shoes of Matt's on him. They were size 3. They didn't fit! His feet are too fat. Cute footies! If you are thinking this picture looks familiar, you are right. It is a picture I have posted before because it is all I have on me at work. So give me a break.